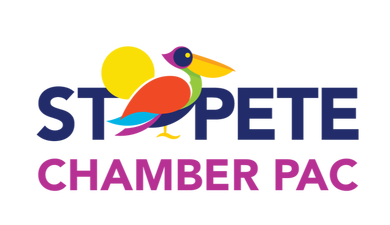 The St. Pete Chamber PAC is an active advocate for a strong and vibrant St. Petersburg. The mission of the St. Pete Chamber PAC is to make a significant positive impact with state and local government and to foster a pro-business environment. To achieve that goal, the St. Pete Chamber PAC advocates in support of Chamber initiatives through campaign support, electioneering, and other issue advocacy strategies. As a tool to successfully advocate on behalf of business and commerce, the St. Pete Chamber PAC was created to also provide the business community an opportunity to research and interview candidates in our local elections. The PAC is funded through individual and corporate contributions and has a separate board governing its efforts. Members are encouraged to support the St. Pete Chamber PAC through voluntary contributions. NOTE: These amounts are suggestions only. There is no limit on the amount that can be contributed to a political committee supporting candidates or issues. (Section 106.08, F.S.) Contributions to the St. Pete Chamber PAC are strictly voluntary. State law requires political committees to report the name, mailing address, occupation and name of employer for each individual whose contributions aggregate in excess of $100 in a calendar year. I understand that contributions to the St. Pete Chamber PAC are not deductible as a charitable contribution on Federal Income Tax returns.